Creative Week in the Works! When Mondays are met with sunshine and spring time, it begins the week with a zesty flair! This week is a celebration of creativity, connections & caring. Tonight I am off to do a presentation at the Keswick Ridge Quilt Guild, speaking about my design work, books and fabric. Tuesday is a very special day, a Celebration of Life for my dear friend who passed away Friday night. Donna was very talented and I am blessed to have had her as my friend. I have many pieces she created as gifts from painting to quilting she infused every piece with her love. Wednesday is the Sizzix Scoreboards TM Teacup Blog Hop by designer friend Eileen Hull. Sunday I am taking part in the Scotiabank Relay for Life Fashion Show. In the new issue of Create & Decorate are spring vegetables I made for Dow using STYROFOAM TM brand foam and National Nonwovens Wool Wisps TM. 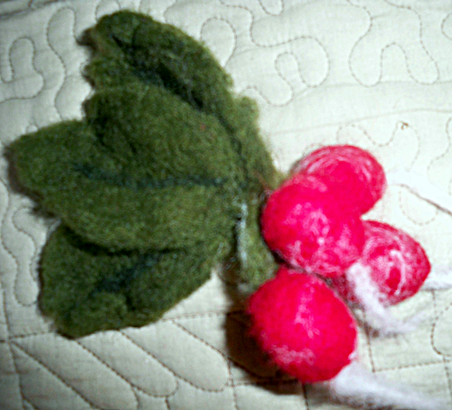 Needle felting on foam is so easy, the full instructions are available in a download on their website as well. The radish were my favorite to create. The current issue of Creative Homearts features my column "Make it Green" and my visit to Mrs. Grossman's sticker company. Links to pictures are on my website's front page. So to a creative week everyone! Embrace creativity, a cause & those close to your heart always! Follow the JOY! Debra, CEO!